The Venereal disease research laboratory (VDRL) test is a non-treponemal microflocculation test which is used for screening of syphilis. It detects the IgM and IgG antibodies to lipoidal material released from the damaged host cells, as well as to lipoprotein-like material and possibly cardiolipin released from the treponemes. The presence of lipoidal antibodies in patient’s serum or cerobrospinal fluid (CSF) is detected by using non-specific antigen, suspended in buffered saline solution. The cardiolipin antigen is an alcoholic solution composed of 0.03% cardiolipin, 0.21% lecithin and 0.9% cholesterol. The heat inactivated (to destroy complement) serum or CSF is mixed with VDRL antigen. If the specimen contains reagin, flocculation occurs which can be observed using microscope. 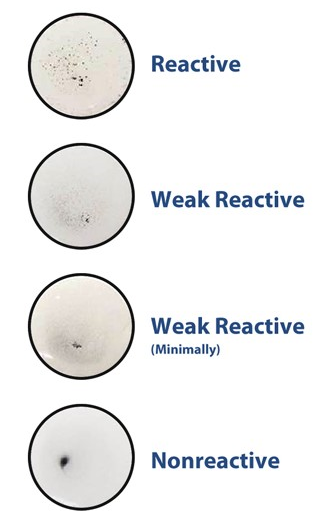 Non-reactive specimens appear as homogeneous suspension. Only serum and CSF are appropriate specimens for VDRL testing. Serum should be heated to 56 degree celcius for 30 minutes to destroy the complement, while no heat treatment is requied for CSF. Bring the VDRL antigen suspension, controls and samples to room temperature. 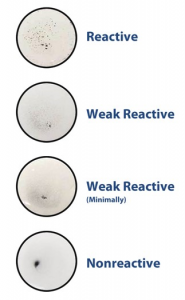 Add one drop of well-mixed VDRL antigen next to the test specimen, positive control and negative control. Using a mixing stick mix the test specimen and the VDRL reagent thoroughly spreading uniformly over the entire reaction circle. Observe for flocculation microscopically at 8 minutes. Biological false-positive reactions can occur with cardiolipin antigens, mainly in specimens from persons who abuse drugs; who have diseases such as lupus erythematosus, mononucleosis, malaria, leprosy or viral pneumonia; or who have recently been immunized. What is the principle involved in the VDRL test? a. Agglutination b. Precipitation C. Flocculation d. Opsonisation.